Too many repressive regimes have found a place on the United Nations Human Rights Council, rendering it ineffective as a voice for democracy and human rights, according to abuse victims, human rights groups, and members of Parliament. The solution is to vote in countries that meet the basic criteria required of council members—that they have good human rights records. That is not the case, however, according to Liberal MP Michael Levitt, who chairs Parliament’s human rights subcommittee. “What we see with the U.N. Human Rights Council is a body that seeks to spend a disproportionate amount of time on one country, focused on Israel, a democracy. That cannot be allowed to continue. There must be a voice for democracy, a voice for human rights, heard on the council moving forward,” he said at a Parliament Hill press conference on Wednesday, Oct. 5. With some of the world’s most noted human rights abusers—China, Russia, Saudi Arabia, and Cuba—now up for re-election, Levitt and others hope that will change. For the family members of the abused, it is imperative. “I came from a country where having an opinion is not considered a human right,” said Rosa Maria Paya, a Cuban human rights activist and daughter of legendary activist Oswaldo Paya. For Yang Jianli, a former political prisoner and survivor of the Tiananmen Square massacre, the U.N. offers a rare chance for countries to collectively address the Chinese regime’s abuses. “In recent years, many democracies have been afraid of angering China so they have made little or no effort to push on human rights bilaterally with China. But the U.N. mechanism provides opportunities for them to come together to confront China on its human rights record collectively,” he said at the press conference. The current state of the U.N. Human Rights Council (UNHRC) makes it ineffective, say critics. That is largely the result of how votes are traded between countries, according to Conservative MP and former environment minister Peter Kent. Currently, when countries make deals for support, one country will pledge a vote for a motion here in exchange for a vote to be on a committee there, and so on. Votes for membership of the UNHRC, like many votes at the U.N., are anonymous, however, protecting countries from scrutiny. I think governments over the years have compromised themselves behind the secrecy of those traded votes. “I think governments over the years have compromised themselves behind the secrecy of those traded votes,” said Kent. When leaving the House of Commons later that day, Foreign Affairs Minister Stéphane Dion, upon being asked if Canada would support China’s re-election to the UNHRC, said a decision would be made public at some stage. “Canada will announce its decision in due time, but what I can say is that the strong voice of Canadians speaking for human rights is something we also consider, especially when you have a champion like Irwin Cotler,” Dion said. 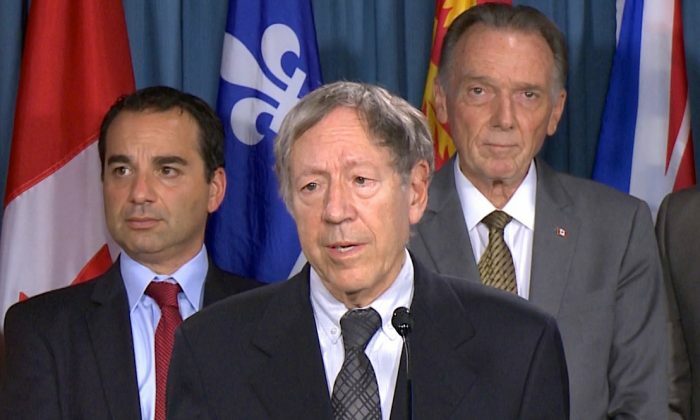 Cotler left politics last year after a respected career as an MP and former Attorney General of Canada to found the Raoul Wallenberg Centre for Human Rights. That group partnered with UN Watch and the Human Rights Foundation to bring together the family members of victims of human rights abuses in UNHRC countries. “They suffer the ongoing pain and torment of their loved ones being in prison and tortured in prison, and the ongoing pain of seeing human rights violators of those prisoners elected to the U.N. Human Rights Council,” said Cotler.